Join us this First Friday, December 7, for the festivities! Get into the true holiday spirit by supporting your community. 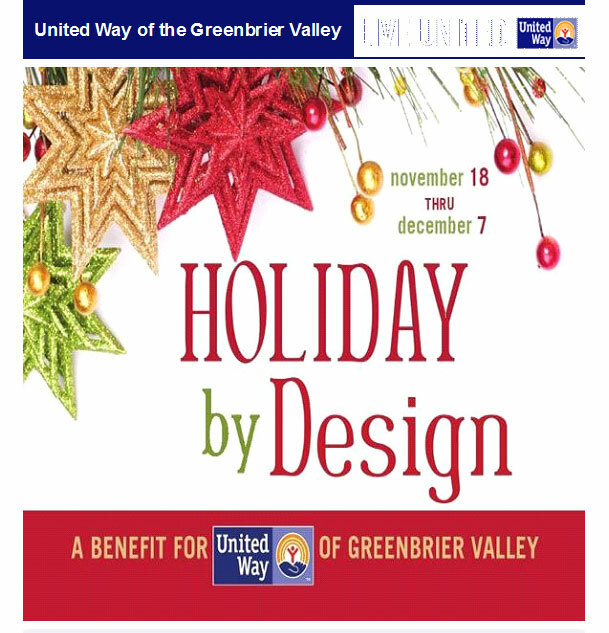 The United Way of the Greenbrier Valley is partnering with the Greenbrier Valley Convention and Visitor's Bureau and First Energy to bring you the 3rd annual Holiday by Design Finale. Enjoy refreshments and live holiday music from Tony Haworth from 5-7pm. You will have the opportunity to view and bid on the holiday inspired decorative items through a silent auction, with the proceeds benefiting United Way. Vote for your favorite large tree for $1.00 and be entered into a drawing for an IPad! Proceeds from the voting go directly to the Warming Hearts and Hands, a fund that provides emergency heating assistance for families. Large trees will be available for purchase at a live auction event at 7pm. Purchase a tree for yourself or donate it to a local non-profit organization. Cash, check or credit card accepted for all items.